Toyota’s first production vehicle, the Toyoda AA. The curtain on our history opens with this car, and the establishment of the foundation for the automotive industry in Japan. In order to achieve the dream of a domestic car for the masses, Toyota Automatic Loom Works, Ltd. established an automotive division in 1933. In the following year, 1934, a steelmaking division was established in order to obtain steel which would provide the needed strength and machining characteristics for producing automobiles. 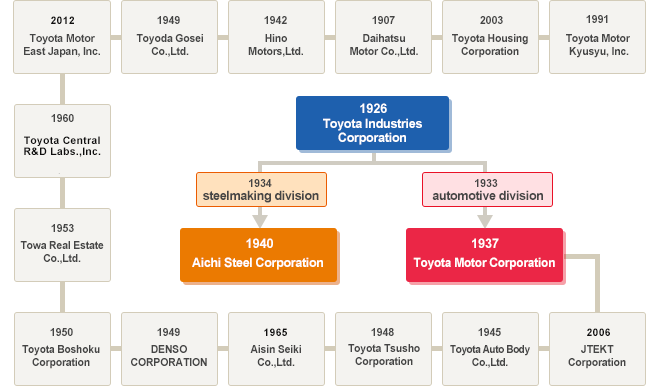 Over time, the automotive division became Toyota Motors, while the steelmaking division evolved into Toyota Steel and then Aichi Steel in 1945. As a member of the Toyota Group we have inherited the DNA of a material manufacturer and work to produce high quality products. Toyota Auto Body Co.,Ltd.Opens the website of Toyota Auto Body Co.,Ltd. Aisin Seiki Co.,Ltd.Opens the website of Aisin Seiki Co.,Ltd. Towa Real Estate Co.,Ltd.Opens the website of Towa Real Estate Co.,Ltd. Toyota Motor East Japan, Inc.Opens the website of Toyota Motor East Japan, Inc.
Toyoda Gosei Co.,Ltd.Opens the website of Toyoda Gosei Co.,Ltd. Hino Motors,Ltd.Opens the website of Hino Motors,Ltd. Daihatsu Motor Co.,Ltd.Opens the website of Daihatsu Motor Co.,Ltd. Toyota Motor Kyusyu , Inc.Opens the website of Toyota Motor Kyusyu , Inc.